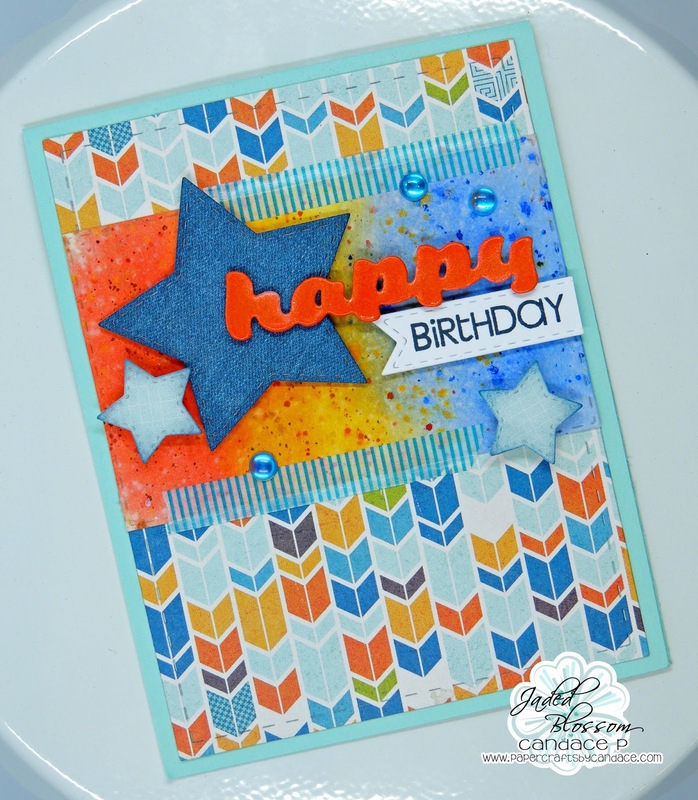 Paper Crafts by Candace: Happy Birthday! I don't know about you but I have tons of cards laying around but I never have guy themed Birthday Cards! So of course I had to whip up one that I need for tomorrow.. but LOVE how this one turned out! I found this fun background paper from Echo Park and just knew I wanted to use it. But I didnt like the other options that went with it so I made my own mat with my watercolors. I love this easy card layout. From Jaded Blossom I used our Card Mat Dies, Goody Bag Die, Star Dies, Spring Word Dies (happy) Mini Tag Dies and So Many Birthdays stamp set. To make Happy look glossy, I cut it out in orange paper and then used orange embossing powder over the top. LOVE embossing on die cuts.